Las Vegas public works crews are preparing for another weekend of rain, which could wash ash and soot from the recent Mount Charleston fire into the valley, creating dangerous road conditions in the northwest part of the valley. With chances of rain forecasted through the weekend, the city issued an advisory Thursday warning residents to watch out for street flooding, especially on Grand Teton Drive between Durango Drive and Rainbow Boulevard. If the rain is heavy enough, it’s expected to wash ash and soot from the Mount Charleston fire down into the valley. The black, mucky combination of water, ash and soot “is an extremely slippery mixture and if driven through is much like driving on ice,” the city said in its advisory. Motorists are discouraged from driving through these flows because of the danger, the city said. “We’re doing everything we can do to be ready, but I encourage people to stay out of these areas if they become flooded with ash and soot,” Las Vegas Councilman Steven Ross, who represents the northwest part of Las Vegas, said in a statement. The Carpenter 1 fire is about 90 contained and Kyle Canyon residents are beginning to return. The fire has been burning for 16 days. Firefighters continued to make progress on the once-rampant wildfire on Mount Charleston Tuesday containing 85 percent of the nearly 28,000-acre fire. The 16-day fire that has scorched acres upon acres of forest and vegetation has dwindled into a creeping, smoldering flame. Only a few flames remain near Carpenter Canyon and the South Loop trail, said Kerri Paniagua-Smith, a public information officer with the incident management team. The threat from the fire that has cost about $17.8 million is almost gone, said incident management team officials. As a result, Kyle Canyon residents and employees remain on track to return at 10 a.m. Wednesday to their homes and businesses. About 400 people were evacuated from the area on July 4 due to the danger posed by the fire. The flames ended up destroying six structures in Prospect Springs Ranch, but spared the Kyle Canyon homes about five miles northeast. With most residents returning to their homes, massive smoke plumes disappearing and some firefighters returning home, it's becoming more and more apparent that the 28,000-acre wildfire that has burned on Mount Charleston for the past two weeks is coming to a close. And with Sunday's announcement that residents of Lee Canyon will be allowed back home Monday morning, coming on the heels of Trout and Lovell Canyon residents returning home Sunday, it might appear that the danger has passed. Not so fast, fire officials said. Although fire crews are making progress, several problematic borders remain uncontained, and there are possible hot spots and areas where the fire could restart, Fire Information Officer Jon Kohn said. Also, although crews are beginning to demobilize, dropping the number of firefighters and support service workers from a peak of 1,300, crews could continue to work on the fire past the estimated containment date of July 19. "Half the work of the fire comes after the flames go out," he said. One of the problem areas is near the northwest side of the blaze, where fire progress was stopped by a steep cliff that fire officials have dubbed "goat rocks" — areas on the cliff where it's difficult for firefighters to establish containment lines because of the steep terrain. Because there's "less than a remote chance" of the fire spreading past the cliff, residents of Kyle Canyon, who remain evacuated, could return home with fire still raging, Kohn said. 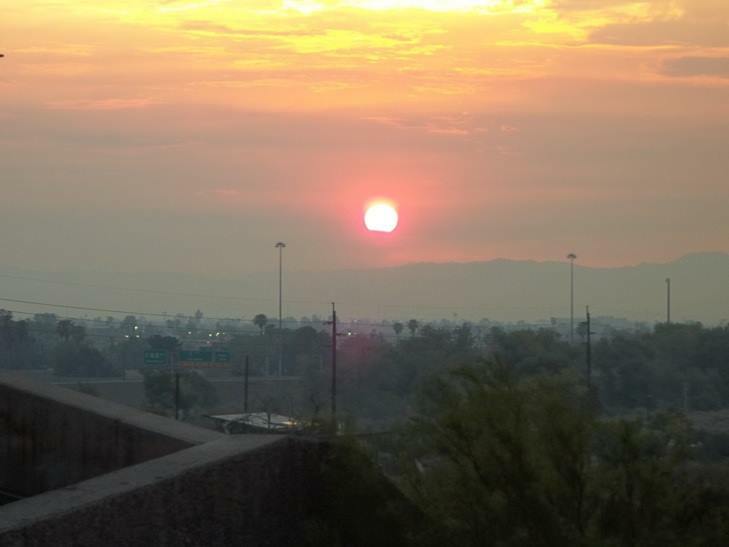 The morning dawns hot and clear and the high temperature at McCarran International Airport will reach 114 degrees. A small wave of moisture flows into the region off the Pacific. It prompts discussion inside the National Weather Service office on Dean Martin Drive near Blue Diamond Road, where the daily fire weather report is being prepared. Forecasters warn firefighting agencies of isolated, gusty thunderstorms with little, if any, rainfall. By mid-morning, cumulonimbus clouds, encouraged by the upslopes of the Spring Mountains, form their signature thunderheads. Inside the top of these dense clouds, moisture turns to ice chunks that chaotically collide with one another, creating electrical charges. Lightning is discharged within the clouds and between clouds. A lightning bolt, stretching longer than a mile, strikes the ground 5 miles southwest of the Mount Charleston Lodge, on a mountainside peppered with pinyon and junipers. The interagency wildland fire dispatch center, located at the North Las Vegas Airport, receives the first inkling of a problem at 1:12 p.m. It’s a call from U.S. Forest Service Engine 454 that, with the weather service’s earlier warning, had been sent out to patrol for lightning-triggered fires. The four-person crew, on State Route 160 near Pahrump, sees smoke rising from near Carpenter Canyon on the west side of the Spring Mountains. The fire's name sticks — in the official logs this becomes the Carpenter 1 Fire — even though it’s closer to other prominent canyons. Fire officials say the fire is too inaccessible to send a ground crew. Rodney Giles bought a cabin and moved in 1974 to Rainbow Canyon, a mile or so below the Mount Charleston Lodge off Kyle Canyon Road. He has seen three fires come and go. This evening, he hears from a neighbor there’s a small lightning-sparked fire on the side of the mountain facing Pahrump. He shrugs it off. 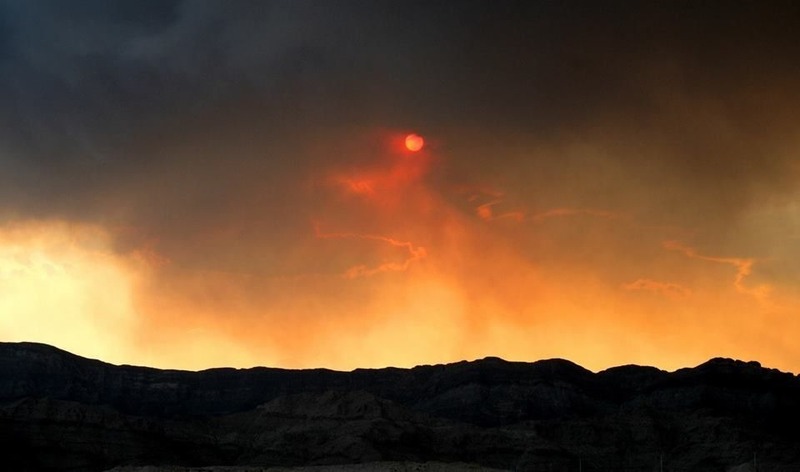 Firefighters battling the wildfire on Mount Charleston have been praying for rain. On Thursday, they got it. Containment on the massive fire increased to 43 percent Thursday evening, marking significant progress in subduing the 11-day-old blaze. Officials said rain, increased humidity and cloud cover helped firefighters suppress portions of the fire, which continues to pose problems in the difficult mountain terrain. Fire officials initially announced the fire was 25 percent contained at a late-afternoon community meeting at the Red Rock Canyon National Conservation Area Visitor's Center, but later announced the bump in containment. The fire grew to nearly 28,000 acres Thursday, with 1,386 personnel responding to the blaze. Crews should be able to secure most of the southern perimeter over the next few days, officials said. On Friday, firefighters plan to continue mopping up the contained areas of the fire, and to look for areas to curb the fire's growth near the cliffs by Kyle Canyon Road. The Mount Charleston wildfire burned six structures Tuesday night in Prospect Ranch as the fire continued its path of destruction. After charring nearly 40 square miles of the mountain, the fire reached its first buildings in the Harris Springs area, burning one commercial building and five other structures, officials said. Rodney Giles, who has refused to leave his home on Mount Charleston, reported that a house with a garage and a couple cabins next to it burned in Harris Springs. Giles said he heard about the incident and was shown photos by his neighbor, who is a volunteer firefighter. Officials could not confirm Wednesday if any of the structures were residences. One of the structures that burned was a metal outbuilding in Prospect Ranch, about five miles to the southheast of the housing developments in Kyle Canyon. The commercial farm building had been treated with fire retardant but couldn't stand up to the heavy flames, said Rich Harvey, incident commander for the Great Basin Incident Command team. One official said he thought the building was in an isolated spot and had been used to store farming equipment or hay. Firefighters faced a tough adversary Tuesday — a 20 mph southwest wind that was gusting to 30 mph. The winds swept the wildfire northeast into another 5,000 acres on Tuesday afternoon, with flames jumping from the treeline south of the main road on the mountain, Kyle Canyon Road, into the desert terrain. "It got hot. It got windy. It got crazy," Harvey told a gathering of evacuated residents Tuesday night at Centennial High School. "We were chasing it all day long." The Carpenter One fire has grown to over 19,000 acres and has extended to Kyle Canyon Road. The fire also destroyed a building at the Prospect Ranch subdivision and jumped Highway 157. The fire skirted the Rainbow community and began traveling east below the subdivision. “The #carpenter1fire has has increased in intensity on the eastern perimeter and bumped Hwy 157 near mile marker 6,” Rich Harvey, incident commander for the Great Basin Incident Command team, said in a tweet. He later added that the fire, which grew about 5,000 acres Tuesday, had crossed the road. Suzanne Shelp, a public information officer for the U.S. Forest Service, said the location was about six miles away from any homes or other structures. With the fire jumping across Kyle Canyon Road, Shelp said it is getting into more sparse desert terrain distinguished by Joshua trees and desert shrubs, so it would have less of a chance of spreading. Firefighters are hoping to have the Mt. Charleston blaze 100% contained by July 19. As of today, Monday, July 8th, the fire is only 15% contained and covers ov 15,000 acres. According to press reports, the Carpenter One fire is the top priority fire in the Western states that include Nevada and the second top fire priority in the country. The firefighters priority is to keep the fire from spreading into Kyle Canyon. Flame retardant is being sprayed on the west side of the local landmark. The air tanker was brought in from San Bernadino. The weather is not cooperating as the temps are starting to rise and the air is getting drier. The recent rain didn't happen on the mountain. We will keep you posted as this story continues.